Senate Republicans continue to throw out long-held Senate traditions in their mission to confirm as many of President Trump’s nominees as possible to the federal bench. Once confirmed, these judges will rule on cases that affect all of us including environmental issues, health care, civil rights, and voting rights. Following the confirmation of Neomi Rao last week to the influential D.C. Circuit, 20 percent of judges sitting on the circuit courts will have been nominated by President Trump. The U.S. Circuit Courts of Appeals are significant because they are often the last word in federal court cases. Another nominee advanced despite lack of blue slips from home-state senators: The Senate Judiciary Committee will hold a hearing on Kenneth Lee (9th Cir., Cal.) and Daniel Collins (9th Cir., Cal. ), who are both lacking support from Ranking Member Feinstein (D-Cal.) and Senator Harris (D-Cal.). Senators Feinstein and Harris have called for Lee’s nomination to be withdrawn due to his failure to provide a comprehensive record of his writings. Second-ever judge confirmed without blue slips from either home-state senator: Last week, the Senate confirmed Paul Matey (3d Cir., N.J.). Matey is the second ever judicial nominee confirmed without support from either home-state Senator. Two weeks ago, Eric Miller (9th Cir., Wash) was the first ever judicial nominee confirmed without support from either home-state Senator. Chad Readler (6th Cir., Ohio) and Eric Murphy (6th Cir., Ohio) were confirmed last week, despite lacking support from Senator Sherrod Brown. Last week, the Senate confirmed Neomi Rao (D.C. Cir.). Rao’s nomination has been controversial due to her college writings, which expressed extreme views on sexual assault, gender equality, multiculturalism, and affirmative action. Rao did not disavow these views during her hearing. With her confirmation, 1 in 5 currently serving circuit court judges were nominated by President Trump. Two weeks ago, Allison Rushing (4th Cir., N.C.) was confirmed despite having less than 12 years of experience and little exposure to the court on which she is nominated to serve. Senate Majority Leader Mitch McConnell’s push to fast-track district court nominees: On top of these trends, the Senate majority is seeking to change the rules to bring nominees to the Senate floor at an accelerated pace. The Senate Rules Committee approved legislation to reduce hours of post-cloture debate on district court nominees from 30 hours to 2 hours. A legislative rule change would normally require a 60-vote threshold. Sometime soon, Republicans are expected to use a maneuver to adopt the rule change on the floor with a simple majority (51 votes). This change promises to further speed up the confirmation of judicial nominees in the months to come. The 47 currently pending district court nominees could be confirmed in a matter of days once debate is limited to 2 hours. Lifetime federal judges are meant to be impartial arbiters of the law, not serve at the pleasure of any elected official. They rule on areas of the law that affect people’s everyday lives: civil rights, criminal justice, education, environment, labor, immigration, health care, and many more issues. 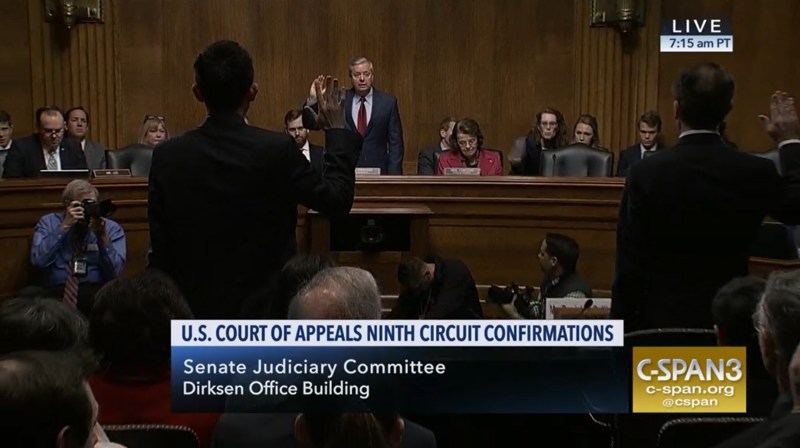 For the courts to fulfill their purpose as arbiters of the law, it’s critical that nominees be qualified and impartial and that senators’ advice and consent responsibility be respected. The Senate is on recess this week and many senators will be in their home states. Tell your senators you care about the courts and want them to stand up for a fair judiciary.